Blog 265 - Missle Launchers by SeaDoo? Geez, don't let anyone from TSA see this, they'll come up with some new ruling and confiscate the dock (can you tell I'm spending a lot of time in airports these days?). These are a new breed of miniature underwater scooters by SeaDoo on the dock across the street from my cabana room at the Casa Del Mar Hotel, Cozumel. With a heavy cruise ship traffic, the "fun in the sun" vendors on the island have a huge array of offerings to the thousands of cruise shippers who want to get off the boat and play a day. 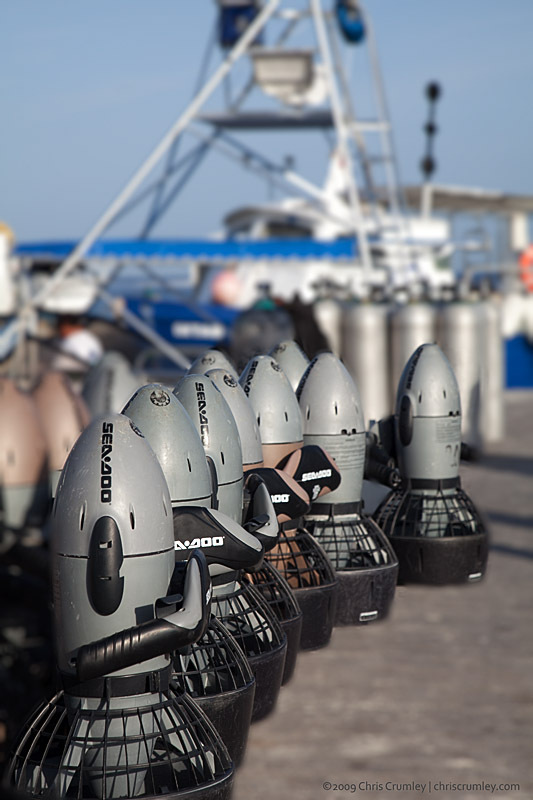 This batch of scooters (aka DPV; diver propulsion vehicles) were destined for a boat loaded with snorkelers. Can't you imagine turning a bunch of people in life jackets loose around a reef with these? Holy Moly Batman!